Open: Tue-Sat 10 a.m.-5 p.m. The Estonian Broadcasting Museum (Eesti Ringhäälingumuuseum) is a non-profit and non-governmental organisation, founded in 1999 by the Association of Estonian Broadcasters (Eesti Ringhäälingute Liit), public broadcasters Estonian Radio (Eesti Raadio) and Estonian Television (Eesti Televisioon), the Estonian Broadcasting Transmission Centre (current Levira Ltd) , and the Türi municipality. 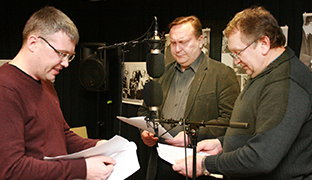 The museum has been established to collect, preserve and exhibit items related to Estonian broadcasting history. Türi, a town in central Estonia has been chosen as the location for the Museum. This town became widely known in 1937 after the State Broadcasting Company (Riigi Ringhääling) completed the construction of a radio-transmitting tower with a height of 196.6 m, which was the most modern facility in Europe at that time. The Museum is located at the railway crossing, a few hundred metres from the train and bus station. The Museum has not been located on the site of the former transmission tower, as retreating Soviet troops blew it up in 1941. The site of the former transmission station has been marked with informative display stands. 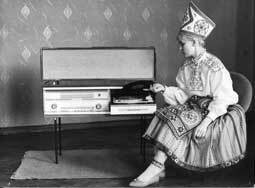 The archival collection consists predominantly of books, periodicals, manuscripts and documents about the history of radio and television, the history of the manufacture of radio and television sets, and the history of listening to radio and watching television. The equipment collection consists of radio and television sets, accessories to receivers, studio, transmission and reporter equipment, and devices for manufacturing receivers by factories, workshops and amateurs. The technical side of broadcasting attracts the most international interest, as most of the equipment was obtained from abroad. The collection in the Museum includes studio equipment imported from England, Germany, Hungary, etc, and radio receiving sets imported from Holland, England, Germany, etc. The memento collection is quite distinctive assembly of souvenirs and awards relating to broadcasting organisations, events, and reporters. The photo collection consists principally of photographic materials, depicting the history of radio, television, and domestic radio manufacturing. This collection also includes photographs depicting broadcasting coverage, the continuation of broadcasting history and the activities of the Broadcasting Museum. The audio-video collection consists of recordings of the memoirs of people who have played a significant role in the history of broadcasting. The recordings of the events organised by the Museum have been included in the audio-video collection. The Museum’s activities were launched on a systematic basis in November 1999. The first exhibition was held In December 1999. The Museum then moved, in 2000, to the current permanent location in a building freshly renovated by the local municipality. The first permanent exhibition was opened to the general public on the 18 December 2001 which was 75thanniversary of the Estonian national broadcasting (18 December 1926). The 1926-1944 section exhibits items and materials from the early period of broadcasting when a private venture that began in a three-room down-town apartment in Tallinn developed into a national broadcasting company; the studios, transmission stations, and programming of which met all contemporary European standards. Exhibits include wax-statues of Felix Moor, the “radio-man”, and Fred Olbrei, the then director of the State Broadcasting Company, models of a carbon and capacitor microphone, a gramophone record cutter, and a scale model (1:75) of the Türi radio transmitting station. Photo stands introduce the radio personnel of that period and the equipment, which was destroyed during WW2. The visitor can also examine the radio-sets, which reflect the standard of radio manufacturing in the 1930s. The 1944-1991 section exhibits the broadcasting activities under the Soviet regime. Various portable recorders for reporters, microphones and details from the transmission station at Laitse make up the exhibition in this section. 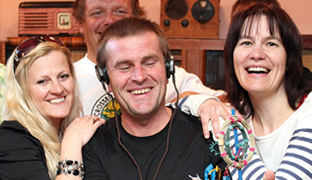 Visitors can, in a recreated recording studio of the period, listen to music and programmes that were recorded on the studio tape available at the time. Photo stands introduce contemporary radio dignitaries and the exhibition of radio-sets represents the production of the Soviet period radio factory “Punane RET”. This period drew to a close when the first private radio stations started to broadcast. The Television section has 130 photographs exhibiting the key moments in the 50 years of Estonian national public television – Eesti Televisioon. Book-like text stands provide detailed information about each decade and both about public and private television. The Television sets on exhibition provide a review of the history of watching TV. There are two particularly interesting exhibits in this section that are the work of Television Engineer, Mati Tähemaa. The first is a reconstructed TV-set with the Nipkow disc, which provides a 30-line television picture (in 1937 there were about 50 such sets in Estonia). The second is a renovated KVN-49 TV-set, originally built in 1955, which has a postcard-size screen which is magnified by a water lens.